The first photo up there is Type by Julia Rothman for Windham Fabrics. I absolutely love it! (And if you have a Paper Source store by you, they sell a notebook with those typewriters on the front as well.) I honestly have no idea what I'm going to actually do with it, but it was too cute to pass up. The below fabric just came out and I've heard a lot of people talk about how excited they are to use it. Especially for making man-quilts for their engineer/architect husband. It's called Architextures by Carolyn Friedlander for Robert Kaufman. There are a few additional prints that aren't shown here - it's a really great line. Brenda made a fantastic quilt using it at Quilt Camp. 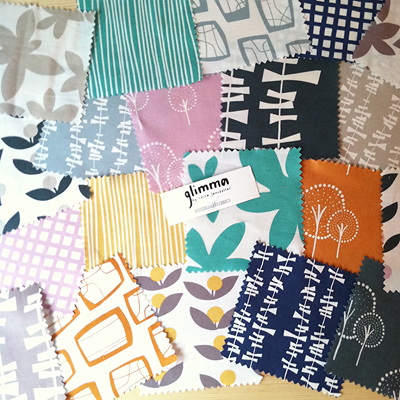 I'm super pumped to get to work with a couple charm packs of Lotta Jansdotter's upcoming line, Glimma, for Windham Fabrics. This fabric will be for sale in April 2013. The colors are just beautiful and pair perfectly with Echo and Bella. The clocks are by Melody Miller - Ruby Star Shining for Kokka. The others are a mix of Timber & Leaf by Sarah Watts for Blend Fabrics and Les Amis by Patty Sloniger for Michael Miller Fabrics. The matching was a total accident - I was clearly in a certain color mood that week! I hope everyone is enjoying the last minute holiday preparations. Things will be a little quiet around here while I recover from whatever bug I've caught and enjoy the holidays. I do have a post planned for Monday with a new quilt pattern though. I hope you will stop by!